Ruth Winslow has finally married off her three younger sisters: she’s free to find a husband of her own. She wants a man with a good heart and a big dream. A man who will treat her as a true partner in marriage. But all the men she’s met in Boston want a woman who’ll say yes, dear and not much else. So she registers to become a mail-order bride. Kansas rancher Garrett Richards is damned if he does and damned if he doesn’t—his sister Elise married the bank’s loan officer so Garrett wouldn’t lose the family ranch. But Garrett suspects that Elise’s husband abuses her, even though Elise denies it. Having failed to convince Elise to leave her husband, Garrett is struggling to make his late parents’ ranch profitable so he can pay off the mortgage. He believes that once Elise’s childhood home is safe, she’ll leave her miserable excuse for a husband. When Garrett misses a payment, Elise’s husband gives him an ultimatum: pay up in three days or I’ll evict you and your new bride. Garrett’s between a rock and a hard place, but now he’s got Ruth in his corner, and she’s about to come out swinging. Can Ruth find a way to keep the ranch afloat and rescue her new sister-in-law from the biggest bully in town? Widowed and kicked out of her home by her cold-hearted mother-in-law on the day of her late husband’s funeral, Nora Alders is horrified when her husband’s brother offers to give her a home—if she’s willing to become his mistress. Nora chooses instead to pawn her jewelry and move into a New York tenement. 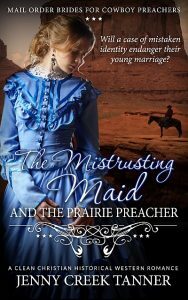 With her funds dwindling, she sees no other option: she must look to the western frontier for a husband. Ben Robertson has everything a successful rancher could want—except for a family. When he connects with Nora through a mail-order bride catalog, it seems he’s about to have it all. She’s exactly his type: smart, independent and resourceful. But when Nora’s mother-in-law learns that Nora might be carrying her grandson, she comes after Nora with a vengeance. How far will the wealthy Alders matriarch go to recover the family’s potential heir? And will the struggle for the child shatter Nora’s fragile new relationship with Ben? This book is bargain priced from 05/16/2016 until 05/20/2016. Orphaned at the age of fourteen, Caroline Akiko Holt found refuge in a factory job painting toys – a job that satisfies her artistic side while still putting food on the table. All she wants is to live the American dream, just as her immigrant British father encouraged her to do. But the exotic looks she inherited from her Okinawan grandmother mark her as a foreigner, no matter how hard she works or how perfectly she speaks. It’s only at her bible study group that she feels accepted. As Caroline’s bible study friends begin to find husbands of their own as mail-order brides, Caroline fears she will never find a man who loves her for who she is. So when Maxwell Kaspar writes to her through the mail-order bride catalogue, The Matrimonial Times, Caroline is delighted that Max seems to love her for who she is. But Max has troubles of his own – troubles so big, they threaten to destroy everything he’s built, including his ranch. Has Caroline finally found a place where she’s accepted as she is – just in time to see it destroyed? The Valentine Mail-Order Bride Series books tell the story of seven young women who attend the same YWCA Bible Study. Will each of them find the love they seek? While these books are part of a series, each of them can be read separately as a stand-alone story. Don’t miss the other books in the Valentine Mail-Order Bride Series! In Faith Parson’s heartwarming clean romance stories, courageous men and their mail-order brides join together to make a new life on the Western frontier. This book is bargain priced from 02/10/2016 until 02/14/2016. 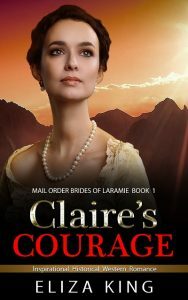 It is 1870 and Odelia Hazelwood decides to become a Mail Order Bride. Odelia Hazelwood moves from Boston to La Junta, Colorado to marry Jimmy Murphy after a short correspondence. Jimmy is an outgoing, boisterous man, and Odelia is a young Boston Belle. Odelia quickly learns that Jimmy owes a small gambling debt to a town bully named Black Jack Ketchum. Jimmy has exacerbated his debt by trying to win his way out of it and losing. Black Jack is claiming Jimmy’s farm and his wife if he cannot pay back his debt. Will Jimmy find a way to repay Black Jack or will he lose everything? Will his new bride stand by him or will she despise him forever? This book is bargain priced from 08/14/2015 until 08/16/2015. This book is bargain priced from 06/19/2015 until 06/30/2032 Check book price before you buy, as prices can change due to expiration of the sale or other technical issues.